Mechanix Wear MultiCam® M-Pact® Gloves are the industry's premier multi-functional gloves for rugged activity out in the field. Mechanix Wear uses EVA foam Impact Guard™ and Thermal Plastic Rubber (TPR) technology as impact and closed-fist knuckle protectors when rendered in certain situations. The M-Pact® gloves were designed with freedom of movement in mind, including a uniquely designed index finger for optimum trigger guard entry. Palms are padded with high-impact XRD® cushioning that reduces interference from vibration and impact that ultimately alleviates stress on your hands thus reducing fatigue. 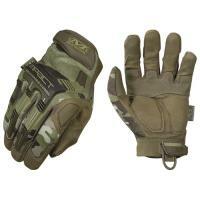 Mechanix Wear's MultiCam® utilize a TPR closure that keeps the gloves snug a weather proof, and Armortex® in the digits alleviates a clumsy grip. Its simple - they work.